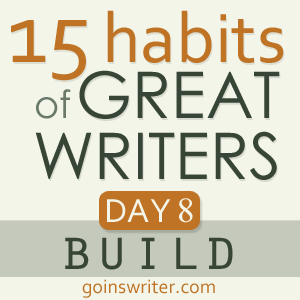 It's Day 8 of Jeff Goins's Great Writers series and I did something terrifying. I published a blog entry I've been working on for months and wasn't sure if I'd share it publicly. Today we are challenged to build. I want you to finish something. Anything, really. Just pick a project — an essay, a blog post, maybe even a book — and finish it. Not tomorrow. Today. Find something and move it across the finish line. Then do the same thing tomorrow. And the day after that. And so on. If you’re still doing this in a month, you’re building something. Until then, you’re just managing tasks. Pick a few that are worth your time, and keep with them. Your work deserves this. I rose up to today's challenge and took the incomplete draft that I've edited, revised, and modified in a period of 6 months and hit publish. It's a blog entry about my years as a single mom and the hearts of my children. I bared myself not only to my kids but to the Internet. I feel as if I just undressed in front of the entire world. But it's okay. I started that blog entry for a reason and if it helps one parent out in Blogosphere then my vulnerability was worth it. You can read the entry here: Bombs of Regret.